Ellis Anna Maria Andersson, 2 years old, was the daughter of Alfrida and Anders Andersson from Kättestorp farm, in Sweden. 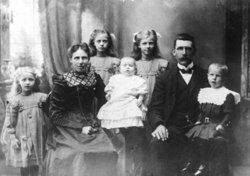 Sadly, the entire Andersson family was lost in the sinking, and their bodies were never recovered. I hope they were all together at least, when the end came.